and reliably produce large volumes of exact copies of USB stick masters. to the master after the copy process is finished. compact but also makes the insertion of media a lot easier. quickly guarantees a smooth priduction even in higher print runs. mains adaptors to ensure power supply. miscellaneous informations (Size of the master, size of targets, writing speed, process, etc. ...). Simply plug the USB stick you want to copy into the first slot and insert the number of copies you want into the other free slots and select "copy". The ADR USB Producers NG work PC-independently thanks to their internal multi-core processor - They only require a current source. 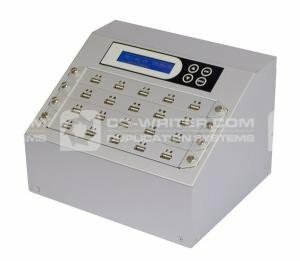 Status messages as well as real-time information on the progress of the copying process can be read directly from the LCD display. You can start a bit by bit copy-check of the copying process which ensures that your data has been copied safely one-to-one onto your USB stick. ADR . USB . Producer . NG . 19 . Targets .